Raised lookout lounge with seating for 14; cocktail lounge with seating for 10. Cocktail lounge doubles as dining area. Two master bedrooms with fullsized beds; shower and toilet annexes. Two double bedrooms with upper and lower single beds; en suite shower and toilet annex; folding sinks and makeup mirrors in rooms. Full meal service. Satellite radio/CD audio throughout; GPS navigation; laundry service. Built in 1948 by Pullman Standard for the re-equipping of the New York Central’s 20th Century Limited. Referred to as the “Most Famous Train in the World,” it was synonymous with first-class service, speed, and comfort. 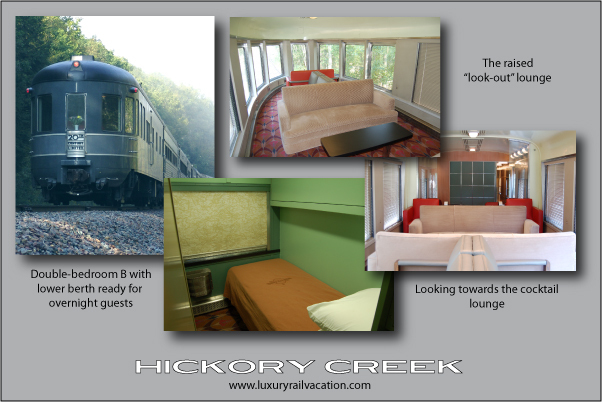 Passengers were guided down a red carpet to board the train, thus this daily tradition being termed the “red carpet treatment.” Acquired by URHS in 1992; rebuilt and returned to service in June 2005.